Surrounded by her loving family, Flora Nye of Perth-Andover, NB, went to join her Heavenly Father on March 29, 2019 at the Hotel Dieu St. Joseph Hospital. Born in Kilburn, NB, on June 30, 1937. She was the daughter of the late Harold and Elva (Kerr) Inman. Flora leaves behind her loving husband of 53 years, Donald Nye; her children, Rayma Price (Jamie) of Keswick Ridge, NB, Malcolm Nye (Yvonne) of Hanwell, NB, Jason Nye (Chanda) of Minnesota; her grandchildren, Jacob, Gracie, Rebekah, Thomas, Matthew, Samuel, Benjamin, Elise, and Andrew; her sisters, Maxine Osborne of Calgary, AB, Ruth Davidson (George) of Kilburn, NB; her brothers, Paul Inman (Hazel) of Fredericton, NB, Gerald Inman (Auralie) of Woodstock, NB, Percy Inman (Gloria) of Kilburn, NB; her sister-in-law, Marietta Inman of Perth-Andover, NB. Flora was predeceased by her parents; her sister, Clara Jackson; her brother, John Inman; her niece, Sharon McCarthy, and her brothers-in-law, David Ruff, John Osborne, and Cecil Jackson. Flora was a lifelong member of the Perth-Andover Wesleyan Church. 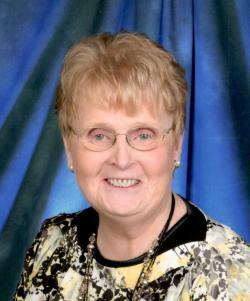 She served as the Director of the Best Years Fellowship for the Atlantic District of the Wesleyan Church. She was also a Past President of the Hotel Dieu St. Joseph Hospital Auxiliary, the former church Sunday School Superintendent, the CYC leader, and also volunteered for the Meals on Wheels Program. She also served on the local Syrian Refugee Committee and was a local school teacher for many years. Flora always did very well at the tasks she took on because her heart was always in it. She loved to entertain and was an expert in hospitality always opening her home for many meals and hugs. Her greatest joy was her grandchildren and her adopted grandchildren. Funeral service was held on Tuesday, April 2, 2019 at 2 pm from the Perth-Andover Wesleyan Church. Rev. Reg Thomas officiated, assisted by Rev. Dwayne Broad. Interment will be in the Kilburn Cemetery at a later date. Music for the service was by Amy Donovan and Janice Broad. Remembrances were shared by Flora's children and grandchildren. Pallbearers were Larry Ruff, Kevin Inman, Randy Inman, Ken Collicott, Jacob Price, and Thomas Nye. Arrangements were entrusted to Brunswick Funeral Home, Perth-Andover.